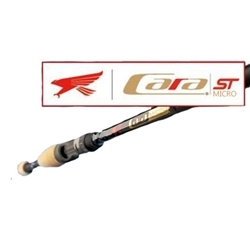 The All New Falcon Cara ST Micro Casting Rods have the new ultra-high tensile strength carbon fiber material which makes them lighter, stronger, and quicker response! This rod also has the latest in guide technology, they have up to 13 Fuji Micro guides with low friction light weight Alconite rings for increased casting distance and lighter weight. Combined with the all new Cara ST graphite blank, it makes for the lightest, most sensitive rod possible. Finesse Jigs: This is the Micro guide version that features a split rear cork for even lighter weight. Head Turner: "Head Turner" is the Micro Version of the classic Cara 6'10" heavy action. Cranker: This is the Micro guide version of the Cara Mansfield rod which is for long casts with lipless crankbaits and medium-sized divers the parabolic action of this rod will aid in hooking and landing more fish. Amistad: This is the Micro guide version of the Cara Amistad built for greater sensitivity and much better balance.